The technology behind access control has progressed immensely over the years, from a simple lock and key to Internet of Things (IoT) technology. Today’s IoT access control solutions are powered by a network with software, and hardware components all working together. As the technology behind access control continues to grow, so does it’s popularity. 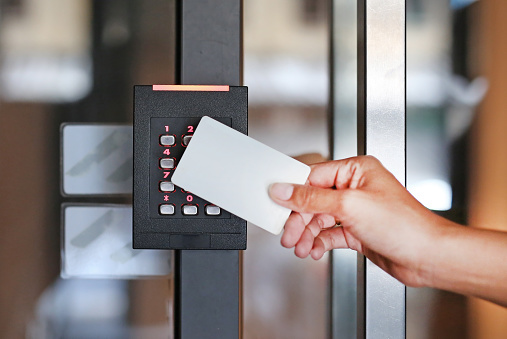 Let’s explore some of the newer entry methods available in the realm of access control that help you take control of access in your business. Electric locks are an upgrade from the standard lock and key. Rather than using a key to open, they rely on some type of technology to open, be it magnetic or motorized. Electric locks are not susceptible to lockpicking. They can often be monitored and controlled by a computer, phone, or tablet. But electric locks are just one piece of the puzzle, and they have to be paired with other devices in order to be opened. Working hand in hand with an electric lock, keypads are simple number interfaces that can be programmed with a PIN number or passcode in order to gain entry. Keypads come in many varieties from physical buttons to touchscreens. They are preferred by smaller businesses and in residential settings where fewer people will need access on a regular basis. PIN numbers can easily be assigned to individual employees or delivery personnel. This aids in keeping track of who has entered or exited the premises. When changes in staff or suppliers occur, an individual PIN number can be removed. This makes any changes as non-disruptive as possible. Access cards work on essentially the same principle as the keypad, but are generally preferred by larger businesses. With larger numbers of employees it can be difficult to keep track of and assign unique PIN numbers. Instead, employees are each assigned a card or key fob and tracking is implemented so it can be known who has gained access to the building and when. This is used as a safety measure for both the employer and the employees so that their whereabouts can be logged at all times. In the event of an emergency or a lockdown situation, it’s important for employers and emergency rescue personnel to know how many people are in the building. One of the newer and more exciting technologies, biometric access control eliminates the need to remember a PIN or carry a card or fob. This also eliminates the risks of a PIN being shared or a card being stolen. The most common biometric technology involves fingerprint scanning, but retina scans are becoming more common. Advancements in access control are changing how things are done and making it easier for both business owners and homeowners to protect their premises. Tracking entry and preventing unwanted traffic has always been the goal of access control. With the technology that’s now available it has become easier and more secure. Call today to schedule your complimentary access control evaluation and quote!